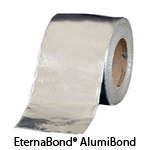 With the 4 mil aluminum backing, EternaBond® AlumiBond is extremely tough and hard, perfect for holding back pressure in holding and gravity tanks. AlumiBond requires no UV protection, and can be painted to match the repaired surface color. AlumiBond is perfect for truck trailers that have been cut or are simply in need of resealing over seams and rivets. It is also perfect for storage tanks, steel and aluminum roofs, etc.